Australian animals include the Quoll, also known as Australian native cats; carnivorous marsupials that are native to Australia and Papua New Guinea. There are four species in Australia, the Northern, the Eastern, the Western and the Spotted-tailed. They have a pointed snout, a long tail and brown to black fur spotted with white. They have bright eyes, a moist pink nose and a lot of sharp teeth. The Spotted-tailed is the largest of the species measuring around 40 to 55 centimetres and weighing around 4 kilograms for the male. The smallest is the Northern measuring around 12 to 30 centimetres and weighing up to 0.9 kilogram for the males. They eat mainly insects, birds, frogs, lizards, snakes, small mammals and fruit. They will also eat carrion (dead animals). The Spotted-tailed, the largest of the species, will eat birds, reptiles and mammals such as Bandicoots, Possums, Echidnas and Rabbits. They are mainly active at night, normally spending their days in one of their dens, although the Spotted-tailed and the Northern sometimes forage in the daytime and sit in the sunshine. Breeding time is in the winter and all four species have a gestation period of 21 days. Only the Spotted-tailed has a true pouch. In the other species, the young are protected by shallow folds of skin around the teats. 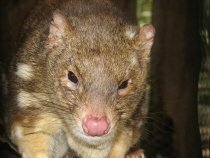 The Western Quoll is found only in the far southwest of Western Australia, where it lives in jarrah forests, drier woodlands and mallee shrubland. The Northern is found from the Pilbara region of Western Australia to southeastern Queensland in rocky, sparsely vegetated areas and open woodlands. The Eastern is now all but extinct on the mainland, but is still common in Tasmania, where it lives in open forest, heath, scrubland and cultivated land. 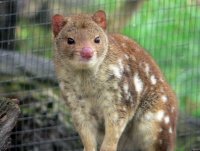 The Spotted-tailed Quoll is found on the east coast of mainland Australia, but is now rare. It lives in forest, woodland and dense coastal heathland.